(Nanowerk News) The name sounds like something Marvin the Martian might have built, but the "nanomechanical plasmonic phase modulator" is not a doomsday device. 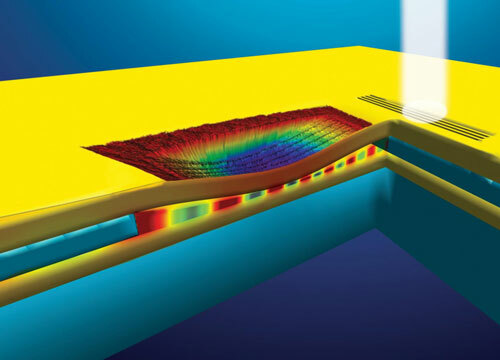 Developed by a team of government and university researchers, including physicists from the National Institute of Standards and Technology (NIST), the innovation harnesses tiny electron waves called plasmons. It's a step towards enabling computers to process information hundreds of times faster than today's machines. Plasmonics combines the small size and manufacturability of electronics with the high speeds of optics. When light waves interact with electrons on a metal's surface, strong fields with dimensions far smaller than the wavelength of the original light can be created--plasmons. Unlike light, these plasmons are free to travel down nanoscale wires or gaps in metals. Their findings were published in Nature Photonics ("Compact nano-mechanical plasmonic phase modulators"). When a control voltage is applied, electrostatic attraction bends the gold strands downwards into a U shape. At a maximum voltage--close to the voltages used in today's computer chips--the gap narrows, slowing the plasmons. As the plasmons slow, their wavelength becomes shorter, allowing more than an extra half of a plasmonic wave to fit under the bridge. Because it's exactly out of phase with the original wave, this additional half wavelength can be used to selectively cancel the wave, making the bridge an optical switch.